Talking of rumors, the Mole has an excellent entry to our contest today, almost knocking Steven Roy off his perch as clear winner of the best rumor award of the week. Steven hangs on at the last, purely because his story is totally plausible, so much more likely to be true than the Mole's elegant but somewhat far-fetched example. Ignoring the possibilities for rumor manufacture, and befitting its factual and responsible image, Autosport has an excellent interview with Dave Richards in which he relates the entire saga of Prodrive's aborted attempt to enter F1 in 2008. Well worth a read, especially for Dave's understanding of both sides of the problem and his reasoned approach to finding an eventual solution. Perhaps even more interesting for American fans, however, is another Autosport article looking at the prospects for a return of the Indianapolis GP. 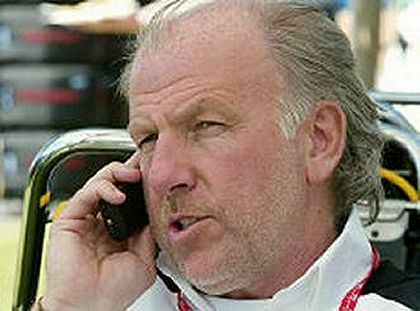 We all know that F1 has to return to the States one way or another (and in spite of Bernie's blustering), so it is good news that the Indy circuit owners have not given up hope of a return to their circuit. The fact is that America really should have more than one Grand Prix if it is ever to impact heavily upon the viewing public. Ideally, there should be three, Indy in the east, perhaps a revamped Laguna Seca in the west and a carefully chosen venue in the mid-west somewhere. In such a huge country, it makes sense to ensure that it has the best chance of attracting race fans from as extended an area as possible. To some extent, this is dreaming, especially with the cost of F1 races being as high as they are. But you don't get if you don't ask and, if countries such as Serbia can think seriously of hosting a GP, the US surely must be able to afford a few. Continuing this brief tour of a few F1 sites, I see that Doctor Vee has begun his assessment of the teams competing in 2007. His thoughts so far contrast a fair bit with mine so I will be very interested to see how sorts out the remaining six constructors. And Ollie White has one of his Caption Contest photos up on BlogF1. The reason I mention this is because, although the photo is just crying out for a snide remark, absolutely nothing came to my mind as I looked at it. There is the famous incident at Spa in the wet, of course, but both DC and MS look far too happy to link the picture to that bone of contention, the paper in David's hand asks to be misinterpreted and the shining walls of the motorhomes also beg for inclusion - but what to say? I confess myself beaten on that one and can only hope that someone else will bring it all together. Finally, something unconnected with F1 but posted by Craig, who often writes of the sport - this video, which I thought amusing. It made me laugh, anyway. Indy always seemed the logical choice of venue, if not my first, second or third choice for F1. From the perspective of trying to draw an audience & growing a US fan base, it's ideal: history, atmosphere and give them their due, after a century of racing, they make it a fairly easy fan experience. I went to the first race and enjoyed it but, from a girl's weekend out perspective, Montreal is still #1 for me. I can't believe even Max/Bernie can be greedy and blind enough to let it go in favour of either no race or a series of temporary venues. I live in Dallas, I remember our one off. It may have been the second worst F1 race ever held. I think 3 US races might be a bit ambitious but, I could see 2 panning out eventually if the FIA would get their act together and stop working on the "Field of Dreams" principal. My choices would be Laguna (do-able) or Road America (oh, if only pigs could fly). I just can't see two midwest races and Indy is too close to Wisconsin. Much as I love the Glen (where I attended my first F1 races) I cannot imagine them accomodating modern F1 and again, it's fairly close to Montreal. Third choice, and possibly best, Road Atlanta. Major transportation hub, plenty of room and stuff for the fans and deep in the heart of Nascar country. They're already race fans if of a different sort. Pointless to speculate though, since not even Indy is on the calendar. They may want to rethink that real quick though with the currency rates the way they are. Indy is already one of the more affordable F1 tickets, a good exchange rate could make quite a difference to the attendance. It's so frustrating, isn't it, Verasaki? The US is wide open for F1 at the moment and I can't imagine that there will ever be a better time for it to start making inroads into the tastes of race fans here - and Bernie lets it go for the sake of a few million dollars that the sport hardly needs, with its ability to hand out monumental fines to those that can afford them.